Has Boxing’s Torch Been Passed to Donaire? 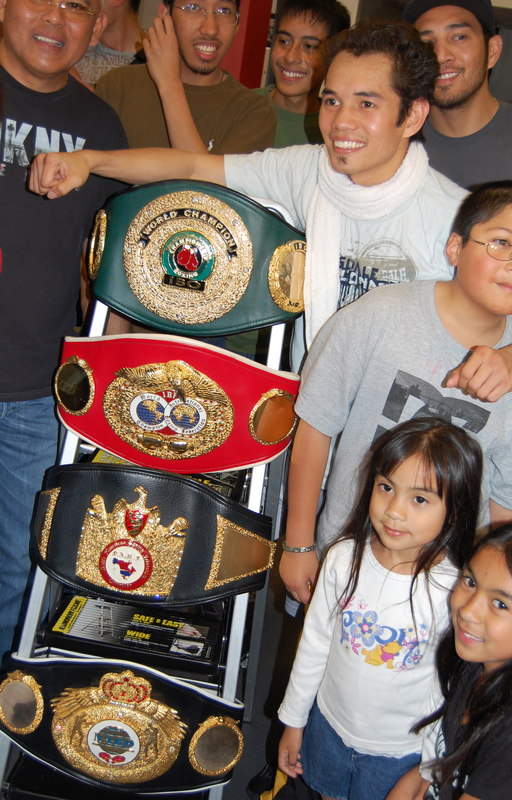 Nonito Donaire, Jr., shown here with fans, displays his championship belts. He retained his WBO super bantamweight title by knocking out Jorge Arce in the third round of their December 15, 2012 bout. The knockout victory of super bantamweight world champion Nonito Donaire over Mexican Jorge Arce on Saturday, December 15, couldn’t have come sooner in easing the pain of Filipino sports fans from Manny Pacquiao’s shocking debacle the previous week. The Filipino Flash methodically demolished his challenger, knocked him down in the 2nd, then at 2:59 in the 3rd round, he unleashed a perfect left hook that sent Arce down for the ten count. Donaire’s victory over a four-division world champion is a sort of redemption for Pacquaio’s loss to Mexico’s first four-division champion Juan Manuel Marquez. Eerily, Pacquiao’s KO occurred at also 2:59 in the 6th round. Are these signs that herald the passing of the torch to Donaire as the new Filipino top boxing star? The win may have clinched for Donaire the prestigious “Fighter of the Year” honors in boxing (to be determined by the various boxing associations, sports media and the Boxing Writers Association, and announced in January 2013), having triumphed over top-caliber fighters in four world championship bouts in 2012, the most by any of the top 10 elite boxers. Ring magazine, considered the bible of the boxing world, also rated Donaire number four in the current pound-for-pound list, below Floyd Mayweather, Andre Ward and Sergio Martinez, and above fifth placer, Juan Manuel Marquez. For the first time in nine years, Pacquiao is not in the top five. More significantly, Donaire, who hails from General Santos City in Mindanao, is also being praised for his voluntary submission to random drug testing 7/24/365, or on any day of the year, and publicly posting its results. Many star athletes in major sports are embroiled in scandals for the use of performance-enhancing drugs (PED), and in boxing in particular, where regulations for drug testing are inadequate or their enforcement inconsistent with the winds of commerce, Donaire’s personal effort to declare himself clean is indeed exemplary and history-making. I. Wilfredo Ver is a boxing enthusiast and an avid golfer.